The No. 14/18 Thunderbird football team claimed their second Big Sky Conference title on Saturday, as they knocked off rival Northern Arizona in the Hinton Burdick Grand Canyon Trophy game 48-20. The Thunderbirds earned an automatic bid to the FCS Playoffs with the victory on Senior Night. There have been a lot of firsts this season for the Thunderbird football team, and there was another one Sunday morning. It was announced on the FCS Selection Show that the Thunderbirds received a first-round bye by earning the No. 8 seed and will host a home game December 2 against the winner of a contest between Weber State and Western Illinois. 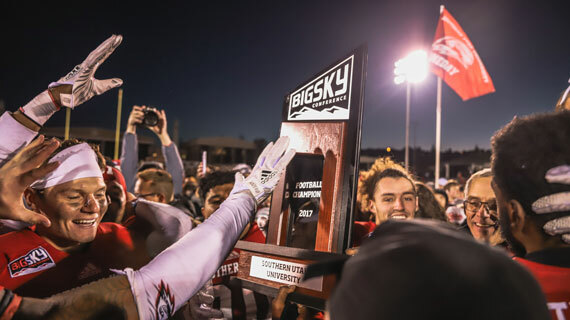 Southern Utah, Weber State and Northern Arizona will all be representing the Big Sky Conference in the FCS Playoffs. Southern Utah is in the same bracket as the No. 1 overall seed James Madison, and with a win in the second round would face off against them in the quarterfinals. Kickoff for the second round contest on December 2 is set for 6 p.m. MT at Eccles Coliseum. Keep tabs on the Thunderbirds by following @SUUFB on Twitter and Instagram and by liking the Southern Utah Football page on Facebook. Read all about the Thunderbirds on suutbirds.com. Tickets for the contest can be purchased online at tbirdtickets.com or at the America First Event Center Ticket Office.